Dream Create Inspire: PMS Makeup 4 The Weekend and Surprise Baby Shower Hop!!! PMS Makeup 4 The Weekend and Surprise Baby Shower Hop!!! It's Friday so that means it's time for Paper Makeup Stamps Makeup 4 The Weekend challenge and in addition, we're having a special surprise baby shower hop for our fellow PMS DT'r Ginger!!! Ginger is adopting a brand new baby boy! We are all so super excited for her! You should have arrived at my blog from Christi S's blog, if not, please start the hop at the PMS blog! Here's my Congrats card I prepared for Ginger. Products used: PMS Baby Horatio, "Congrats" sentiment from Little Moments Mini sentiment set, Neenah and Bazzill cs, Deja View dp, Green Earth ribbon, Memento and Versacolor inks, Copic Markers, Nestabilities, Cuttlebug dies, Fancy Pants button and stick pin, DMC floss, Perfect Puff, DB glitter and machine stitching. Your next stop on Ginger's baby hop is Christi T.! Next up is my card for this week's Makeup 4 The Weekend Challenge. Products used: Paper Makeup Stamps new November release Christms Cheer set, Neenah cs, Basic Grey dp, Memento and Distress inks, Copic Markers, Perfect Puff, DB glitter, Nestabilities, MS Punch and Spellbinders dies, DB Sugar Coated brads and machine stitching. Inspiration for my card also came from this week's Flourishes Timeless Tuesday (FTTC92) challenge and Design Dollies challenge! I hope you can play along! 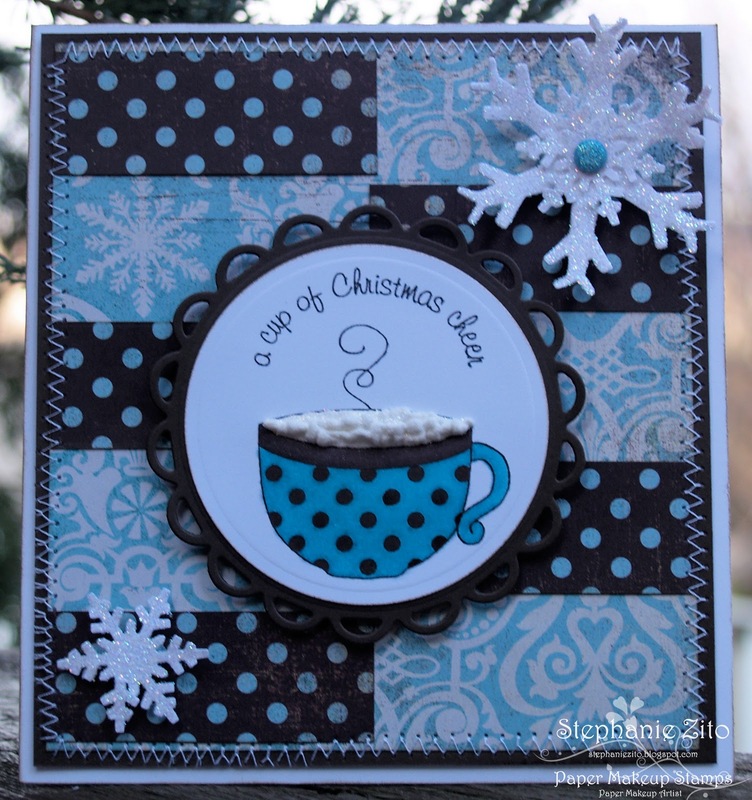 Be sure to link up your card based on the above sketch to the PMS blog by next Wednesday at 12:00 midnight EST. to be entered into a random draw for a PMS single stamp of your choice! Great card! Love the puffy clouds! That baby card is adoreable! Love the cloud! Such a snugglie baby card! Love the combo you chose...and the embellies! 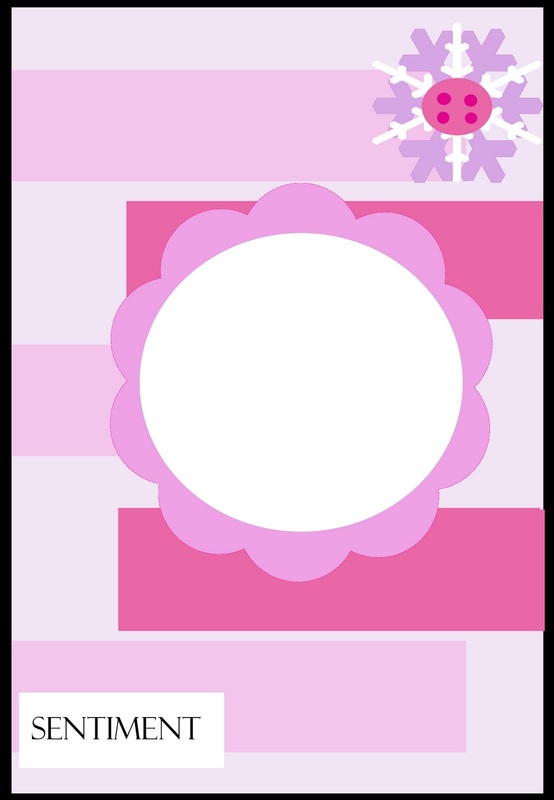 That is the cutest baby card! The puffy clouds are soooooooo cute!!!! And of course I love the circle paper :) Thank you soooo much for thinking of us! I love your M4TW card too and how you used the white fluffiness on it as well, I so want cocoa with marshmallows now! Love that baby, which strangely reminds me of some children I have babysat -- I must be dreaming! And the cup of Christmas Cheer is beautiful - I love the colours. Great work as always Steph. Wow! The Perfect Puff is super fabulous! I think I need some! Thanks for the inspiration and for playing along with the Dollies! Oh I want to sleep on that cloud too. So Sweet! I LOVE that bow with the button too...perfect! These are both just fabulous! Love the colors on both of them and the "foam" on the cup is perfect! Both of your cards are fabbo!! I never heard of Perfect Puff but you make it look so easy to use, and what an amazing effect. Thanks for playing with the Dollies. 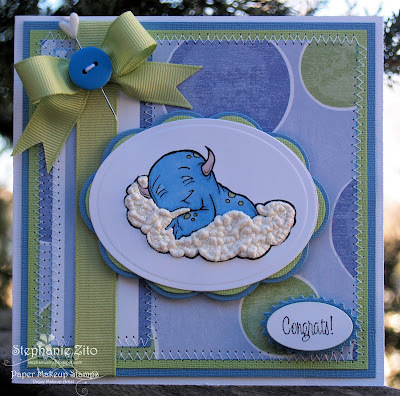 i really love the clouds on the card, i have the applique and forget to use it all the time...thanks for sharing. Both blue cards are gorgeous...you are a pro at making cards.